There's nothing I like better than uncorking a bottle (or two) of locally produced wine while snacking on some locally grown strawberries and steamed locally cultivated broccoli, and then cracking open the scintillating annual SLO County crop report. After all, agriculture is a multi-million dollar part of our economy! Show me the green! The good news is grapes are No. 1 again! Mmm, vino. The bad news is overall crop values fell half a percent from last year mainly because of—according to the crop report—labor shortages. Really? People aren't lining up to work long hours in terrible conditions at inconsistent seasonal employment that pays minimum wage? Weird! Truth be told, according to the LA Times, the average annual farmworker's salary is about $17,500. I couldn't even afford to drink boxed wine on those wages! You know what might help? An immigrant workforce of new green card holders willing to accept such low wages, but thanks to Trump-generated anti-immigrant sentiment, his zero tolerance policy on illegal immigration, and his crackdown by Immigration and Customs Enforcement (ICE) on undocumented workers, local farmers can't harvest their crops! Why not abolish ICE and force all those bozos who get their jollies locking little kids in cages to get jobs picking our crops? Problem solved. Look, I'll admit we do have an immigration problem, but it's that we don't let in enough immigrants! Instead of making it impossible for willing workers to come to the U.S., we should make it easier. Instead of listening to Sir Tweets-a-lot that immigrants are the root of all our problems, we should be praising and welcoming immigrants for the incredible boost they bring to our economy. Immigrants are not the enemy! You want next year's crop report to show an increase in overall crop values? Get off the immigrant-bashing bandwagon and, instead, encourage them to join the U.S. workforce so we can keep the wine flowing! It's the only way I'm going to make it through Trump's full term in office. Oh, and by the way, grapes, you may be No. 1 this year, but there's a new crop in town, and its name is Mary Jane Pufnstuff. If the SLO County Board of Supervisors' conservative majority can just get its head out of its clenched coal-into-diamonds-crushing sphincter for a second and encourage the legal cannabis industry the way it encourages wine grapes, next year when I settle in to read the ag report, I can enjoy my trough of pinot grigio with a nice Orange Skittlz doobie, which will make that steamed broccoli go down a lot easier. Speaking of workers getting the shaft, Trump's reconfiguring of the Supreme Court of the United States is off to a great—and by "great" I mean "terrible"—start. SCOTUS ruled 5-4 in the Janus v. AFSCME case that public sector labor unions can no longer collect "fair share" fees from nonunion members. For years, if a public employee—let's say a Cal Poly lecturer who considers herself a libertarian—didn't want to join the teachers union because she's a cheapskate and believes in "individualism," she'd still have partial union dues taken from her wages and given to the union that had negotiated via collective bargaining said wages and benefits. Those collected fees from nonunion members were essential in funding the union and its activities that protect workers' rights. SCOTUS ruled that "this arrangement violates the free speech rights of nonmembers by compelling them to subsidize private speech on matters of substantial public concern," Justice Samuel A. Alito Jr. wrote in the court's majority. The problem is this: The ruling is just the next step in trying to bust unions and strip workers of their collective bargaining power, which conservatives have been trying to do since the 1970s. It's not about protecting free speech; it's about stripping protection from workers and making it easier for employers to exploit them! Thanks to these ongoing union-busting measures, a lot of public intellectuals have suggested that unions' days are numbered. Maybe if those justices had slung back some Central Coast chardonnay and taken a few puffs of our next cash crop, they wouldn't have been so mean to the unions. Sadly, SCOTUS has become politicized. Citizens United v. FEC, which decided that money is speech and rich people have more "free" speech than poor people, was just the first step in disenfranchising rank-and-file voters. If Trump's next pick of Brett Kavanaugh is approved, kiss abortion rights, gay marriage, and LGBTQ protections goodbye. By the way, Kavanaugh is the second old white man Trump's nominated for the seat; at this rate, SCOTUS will look like the audience at a Lynyrd Skynyrd concert! Can't you smell that smell? It's fascism, baby! I prefer the smell of dank, sticky democracy. And speaking of fascism, ever since Trump's election and all his hateful, xenophobic, and bigoted rhetoric, hate crimes have been on the rise nationwide. According to a new report by the California Department of Justice, our "progressive" state has seen a double-digit increase in hate crimes, including SLO County itself. From the Oceano Dunes to Cal Poly to Templeton High School, there's hate, hate, hate! I was watching a video on the interwebs the other day and saw some white ignoramus screaming at a woman for wearing a Puerto Rico flag-festooned shirt in the U.S. He was completely oblivious that Puerto Ricans are American citizens. That's like attacking someone for wearing a South Dakota flag shirt! The Shredder misses Sweet Home Obama. 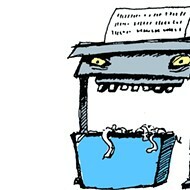 Send ideas and comments to shredder@newtimesslo.com.